The Airbus A350 vs A330neo – What Plane Is Best? The Airbus A330 is a bit of an odd aircraft. It is not as popular as the Airbus A320 series and its not as big as the Airbus A350. In fact, it finds itself right the middle of the Airbus family lineup. The newest version, the A330neo, finds itself in very much the same place as its predecessors. Not entirely a small short-haul plane, but not a large long haul aircraft. Originally designed to compete against the 787 Dreamliner, Airbus has found the sales to be a little wanting. The A330neo-900 has only had 238 orders (with three deliveries) and the smaller -800 version with 8 orders… in total. Thus, does the A330neo-900 find itself in the role as a sub-par A350? Or is it secretly a superior aircraft that will soon find its feet in the marketplace? Let us have a look to see how it compares to the A350. Because the A330neo-800 has not been very popular, we will only be looking at the -900 variant. Likewise, as the -900 version of the A350 is more popular (with 600 orders so far) than the larger -1000 aircraft, we will face both -900 variants back to back. 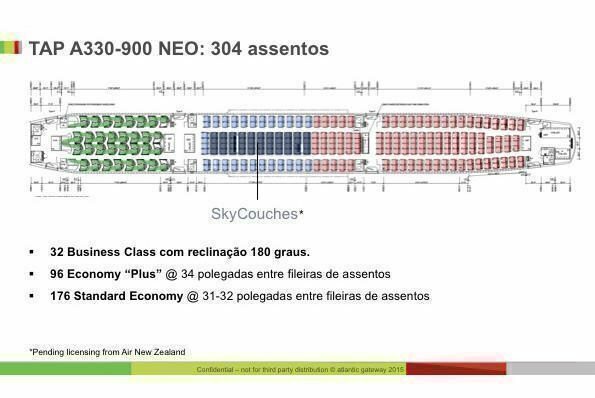 The A330neo-900 can carry 287 passengers on board in three classes, but 440 in a one-class all economy monstrosity. Comparatively, the larger A350-900 can carry 325 in a two-class configuration (The ultra-long-range version the A350, used to fly between Singapore and New York only has 173 seats (80J+93Y) and does not feature an economy cabin) but only 440 in an all-economy configuration. This is a surprise because it means that the A330ne0-900 is equal to the A350-900 if used for a high-density economy format (perhaps for popular domestic routes or short haul), potentially even rivaling the future 797 from Boeing. For comparison’s sake, the A330neo-900 is only 3 meters shorter than the A350-900. We at Simple Flying, however, don’t want to encourage airlines to consider these cattle class possibilities! Ah but surely one of these two aircraft has a better range? 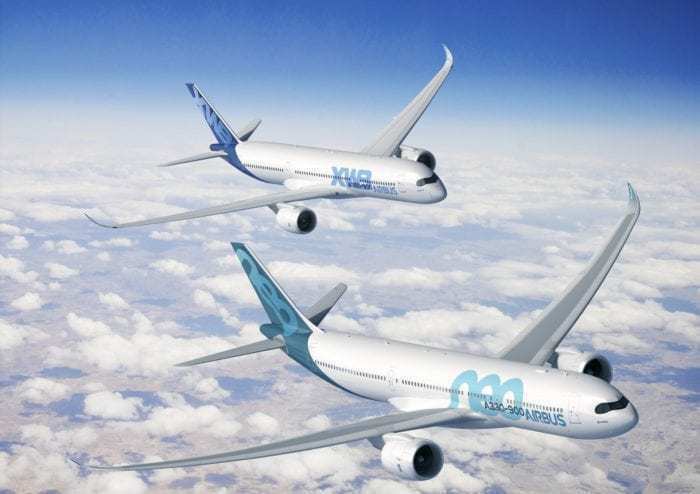 The A330neo-900 has a range of 7,200nmi (13,334km), whilst the A350 has a range of 8,100 nmi (15,000 km). At first glance, it looks like the A350 has the better range, but if we were to compare the A350-900 to the A330-800 (with a range of 8,150 nmi (15,094 km)) we see that A330 could be comparable. But naturally, the A350 has been selected by Singapore for their ultra-long-range route and may be selected by Qantas for operation sunset. Speaking of range and distance, the A350 is also slight faster than the A330 at cruise. This might not be much of a difference on short haul routes, but for longer flights the A350 would get slightly ahead of time. Another factor that should be considered is what it is actually like to fly on these aircraft. The Airbus A350 seats 9 passengers abreast in economy (in a 3-3-3 configuration) whilst the A330neo, being slightly thinner sits passengers in a 2-4-2 configuration. Depending on what you prefer, each plane configuration can greatly impact how comfortable it is to fly. I personally love the 2-4-2 configuration because it means couple passengers can travel together and have that small amount of privacy. If you were an airline, which would you choose? Knowing that these aircraft are essentially the same in quite a few ways, it can be quite tempting to go for the cheaper offer (but keep in mind, real aircraft prices are generally 50% cheaper) over the quality of the A350. – Airlines like hard figures on fuel economy, dispatch rate, and maintenance costs, and tend to be suspicious of projections made by the manufacturer. This also applies to the A350-1000, for example. 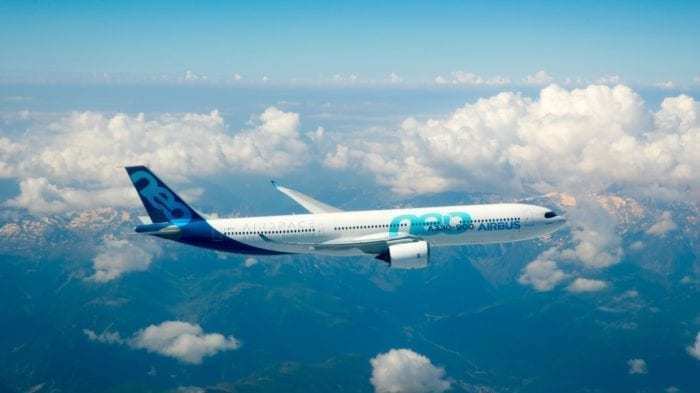 – Airlines are nervous of engine issues, given the fact that the neo’s Rolls Royce Trent engines are similar (same family, but different member) to the Trent engines giving trouble on the Dreamliner. – Airlines are generally unenthusiastic about being the first to operate a new aircraft, in view of inevitable teething problems. Note Qatar’s recent statement that it’s holding off on deliveries of the 777X until the aircraft is up and running at other airlines (Lufthansa is the launch customer). Because the A330 neo has a much lower list price than the A350 or Dreamliner, it’s probably going to become relatively popular among long-haul LCCs, and also smaller airlines with less capital and limited networks. Most long-haul planes are deployed on 6-8 hour flights, on which the A330 performs perfectly well. Another minor point worth mentioning. The A330 has a 2-4-2 economy seating arrangement, whereas the A350 has a 3-3-3 configuration (or 3-4-3 in non-standard ultra-high-density setup). This 2-X-2 configuration is a very popular setup with passengers, since couples can sit together at the sides and/or since there’s one less person to climb over if you’re at a window seat and need to get to the aisle. The only other widebodies with a 2-X-2 set-up in economy are the 767 (2-3-2) and A340 (2-4-2), both of which are being phased out. We often hear that airlines don’t pay too much heed to what passengers like, but I’m not sure that that’s true. Qatar, for example, has hinted that it may keep its relatively roomy A350s for itself, and shunt off its (somewhat more cramped) Dreamliners to Air Italy. Although I love flying the A350, I actually find the A330 to be more relaxing from this specific point of view. Very true comments Nigel, I think airlines are too quick to try and cram as many people in as possible and without thinking about comfort. That’s definitely a point worth being mentioned however, I am really convinced that the only characteristic airlines are interested in is the financial result. The example of Swiss supposed to be a comfortable airline chose the B777 which is an “old” version when it entered in service. It replaces the very comfortable A340. Swiss passengers can afford paying more for more comfort, but the economics made more sense in this configuration and they went for it. And now there is a chance that the B787 will replace the last A340. So the comfort of clients is definitely not the main focus anymore to me. The aviation industry follows a new trend, which is adding a 4th class, the “premium economy”. With this, they offer clients a chance for the price or for a bit of comfort. And I think that from now on, most airlines will go for a high density economic class, and some premium economic seats. The A350 which has a 3-3-3 configuration (or 3-4-3 in non-standard ultra-high-density setup). is perfect for a 2-4 hours flight and the A330 is perfect for people especially couples on long distance flights. As for the”cattle class”term,i think that millions of passengers among whom loads of students and young travelers or week-ends travelers on tight budgets could not care less about being called “cattle” because what’s important to them is the Safety and the Cost of their airline tickets for they would rather spend less money on transportation for their priority is a safe and cheap flight. I enjoy reading your articles and now I have a suggestion for you, so that you can make them better: stop using the expression “cattle class”. It is offensive to millions of travelers, the vats majority of them – fine people. The fact that people who fly in coach have less money at hand than those in business is not a reason to bind them to words, such as “cattle”. I know the idiotic expression “cattle class” is common but what you can do is at least stop using it by yourself. Thank you. Fact is, and I don’t know why for sure, but for quite a few years neither of these have sold all that well. The A350 has just had the luxury of a large backlog from before it started being delivered, but has started seeing some annullations and airlines that have delayed deliveries. Maybe the A330 will compete against the NMA (797),if it is ever built, but first Airbus needs to figure out how to market their wide bodies. This is a super interesting insight – both these aircraft work together with a carrier – much like the B787 & B777 work. So Ultra Long Haul (with greater capacity) it’s the A350 but for many carriers the A330 covers the bases. Qantas has a fleet of 28 A330’s and they are awesome. Flying domestically east to west routes as well as international to NZ and into Asia. The other point is A330 has sold over 1,700 aircraft with currently 1,400 in service in over 100 airlines globally. I think the neo will have a strong future. A frustration for me – I can’t get over the original layout for the B787 was to be 2-4-2 but the economics didn’t stack up (compared to the A330) so they dropped the seat width to under 17 inches to squeeze 3-3-3! I like the Airbus push for 18″ minimum seats for long haul. I’m hoping Qantas goes for the A350 for Project Sunrise! I like the use of “cattle class”. I say if you do not like what you are reading. Do not read it. Just like you have the right not to watch R- Rated movies if you are easily offended. I never think of this as what people can afford but rather the “herding” of as many people as possible in one section of the aircraft. Instead of being offended, perhaps reading the article for its substance would help. Once again, great article Nicholas.